As summer is winding down (noooooooooo! ), we decided it was time for a picnic at the beach. 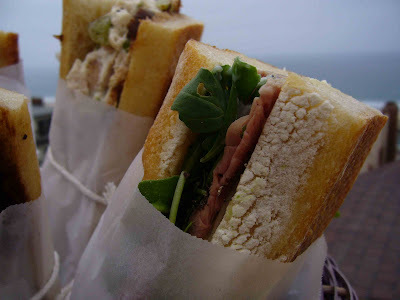 Simple sandwiches wrapped in parchment paper to help keep the sand out and a few sodas was all we needed. As always, when keeping it simple, I believe that the highest quality ingredients make all the difference. Fresh sliced cheese and meat from the deli counter tasted delicious and a rotisserie chicken from the grocery store made quick work of the chicken salad sandwich. Slice baguette open without splitting the two halves completely apart. Spread mayonnaise on both halves. Stuff sandwich with cheese first, followed by arugula and finally roast beef. Close baguette and cut into three equal halves. Wrap in parchment paper if desired and enjoy! Shred chicken breasts and mix together with grapes, celery and mayonnaise. Slice baguette open without splitting the two halves completely apart. Spread pickle on the bottom of the baguette and stuff chicken salad into the baguette. Close baguette and cut into three equal halves. Wrap in parchment paper if desired and enjoy! Mmmmmm...roast beef on a baguette! Sounds perfect for a beach picnic. I really wish that I could find baguettes that tasted as good as the ones I used to eat when I lived overseas. As soon as all of the tourists go home I'm going to have my own beach picnic. The photo of your sandwich is fantastic! I love your site and this baguette, looks yummy!. I am passing this award onto you.Here is the link! Please enjoy!